I have used successfully some Homoeoapthic Mother tinctures in cases of Oral Cancer and Post Operative Cancer cases. 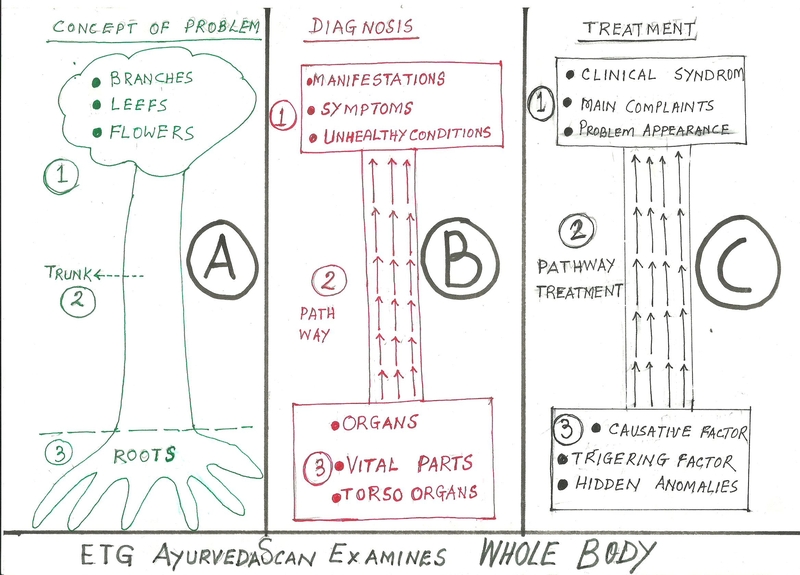 The problem arised after the findings got from the ETG AyurvedaScan reports that the condition for which treatment should be given to patient; there are no perfect medicaments in ayurveda for covering the total condition in appearance. This was the turning point where I have to think over it to use the other medicaments from other medical systems to complete the 100 percent covering of the syndromes of the patient and should not be left untreated any vital part in view of the treatment purposes. Fortunately my attention went to Homoeopathic Mother tinctures, which I was using since over 50 years of my medical practice. Although Ayurveda medical system is totally perfect to treat any physical, mental or bodily ailments, but to make treatment much more fool proof in every angle, some other medicaments are needed either from Unani system of medicines or from Homoeopathic medical system. Since my childhood, I was observing the use of Homoeopathic Mother Tinctures by my Father Late Vaidya Dr. Shitala Sahai Bajpai, a graduate of Ayurveda from Banaras [now Varanasi] and a graduate of Homoeopathy from Calcutta [now Kolakata] , practicing both in Homoeopathy and Ayurveda. I have seen many miraculous cures done by my Father and I still remember his caliber, how he was treating Chronic and Long Lasting disease conditions with their management. Now I and my son Dr Anurag Bandhu Bajpai and my daughter Dr Mrs Sweta Tewari both are using Homoeopathic Mother Ticnctures successfully in almost incurable conditions. The results are very fast just like Allopathic medicines acts in the body and relieves instantly within fifteen minutes in very acute conditions, but relieves also in Chronic disease conditions and long lasting diseases. In Cases of CANCER, where progress is almost nil in Allopathic treatment, homoeopathy mother tinctures acts perfectly to inhibit the progress of disease conditions and puts the curable effects in the disease conditions. and there is a number of Homoeopathic mother tinctures are available to cure or treat the ailing conditions of cancerous patient. Physician community should view the potentials of the Homoeopathic medicaments in this dreaded disease conditions. About 55,000 tourists visit Liechtenstein every year. This blog was viewed about 450,000 times in 2012. If it were Liechtenstein, it would take about 8 years for that many people to see it. Your blog had more visits than a small country in Europe!